Each Guy Robot is a one-of-a-kind handmade creation. 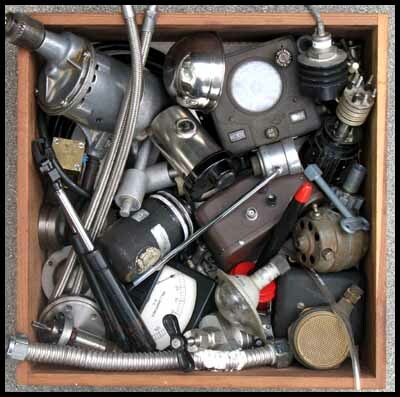 Genesis: The piece parts that go into each Guy Robot flow from a range of industrial tributaries: aerospace and avionics surplus suppliers, automotive salvage yards, long-haul microwave equipment recyclers, decommissioned plumbing and refrigeration remnants, vintage hand-tool swap-meet winnings. And, yes, truth be told, sometimes the perfect Guy Robot find is that gem that is spotted and rescued from among the flotsam hauled to the curb by the neighbors and otherwise destined for final disposal. Metamorphosis: With the reclamation process continually replenishing the Guy Robot parts pipeline, arms, legs, feet, eyeballs, and all prospect appendages are next spread across the laboratory bench where they are left to slowly distill, intermix, and, over time, trigger alchemistic inspiration. It is during this Frankenstein-like step that shoulders are matched to torsos, knuckles to wrists, and body-types to temperaments. Synthesis: After much tinkering and experimentation, the personality of each Guy Robot begins to take shape. This gelling is achieved through a precise, repeatable recipe consisting of one-part slide-rule calculation, two-parts trial-and-error metallurgical alloying, and four-parts leap-of-faith improvisation. Please note: Guy Robots are not toys: they do not walk or talk or give legal advice. They are not dangerous and will not bite, kick, pinch, or emit ozone. Guy Robots will not -- unless repeatedly provoked -- harass your dog or cat. They are unique pieces of handcrafted art, meant to be enjoyed visually and displayed prominently. While requiring only minimal care and feeding, your Guy Robot is guaranteed to provoke discussion, spark new ideas, and generally contribute good vibrations to your life.